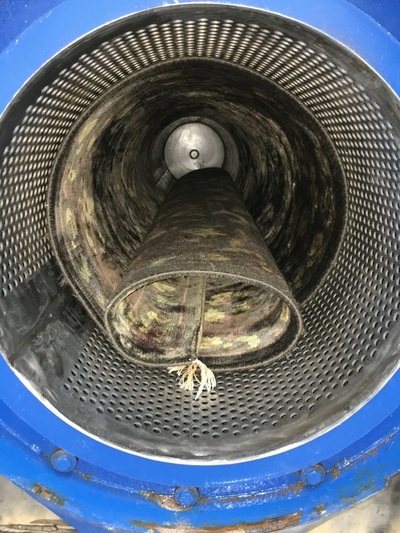 State-of-the-art centrifuge allows us to remove 98% of water in 5 minutes after washing is complete. 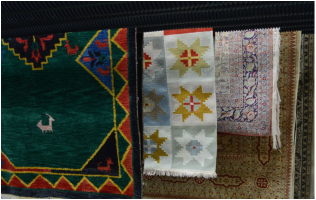 All rugs are then groomed and hung in our moisture controlled environment. Rugs are dry and ready within 24 hours. 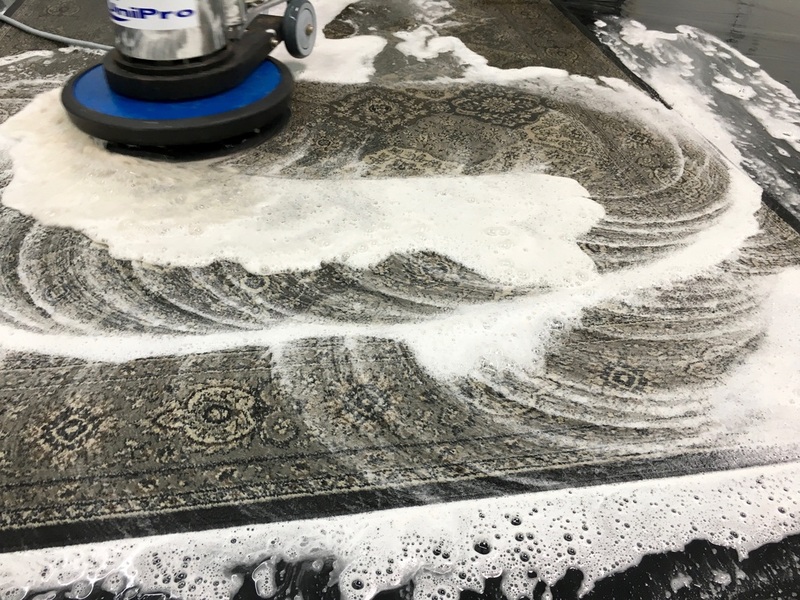 The first step of area rug cleaning is critical - removing all dry soil and dust before the rug begins the washing procedure. Vacuuming the rug is beneficial, but we go one step further using air-dusting equipment. This removes several pounds of dry particulate soil from the rug (the cleaning industry estimates that the average rug can hold 1.5 pounds of soil per square yard of carpet after three years of not being cleaned). This procedure takes 30-60 minutes to complete depending on the size of the rug. After testing for color fastness the rug is ready to move on to the washing process. 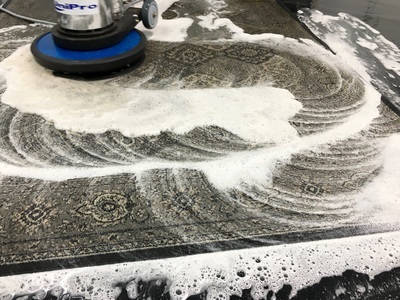 Next, the area rug is washed to remove all soluble soils. We choose the correct cleaning procedure to suit the type of rug that’s being cleaned. 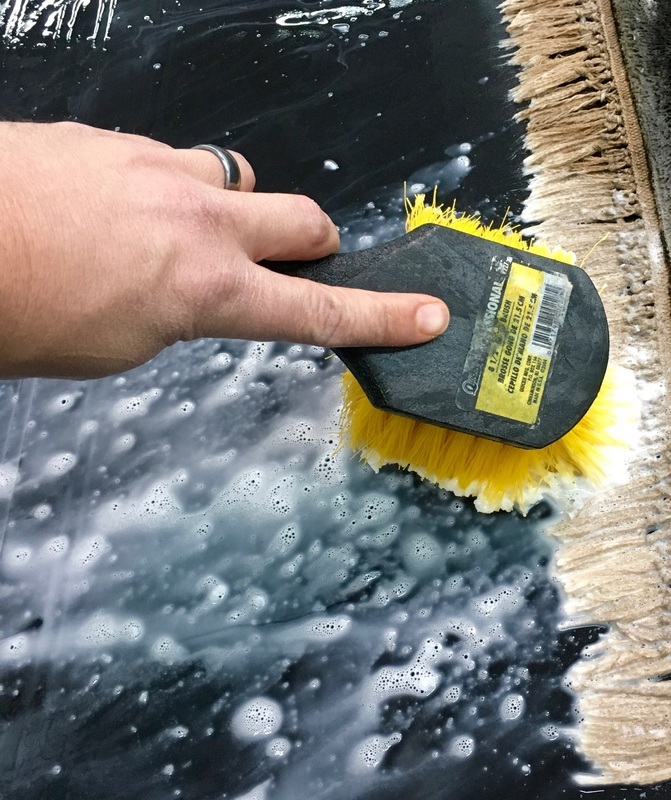 We then brush on our mild cleaning agent specially designed to be gentle and safe on natural fibers, yet strong enough to remove tough soils. 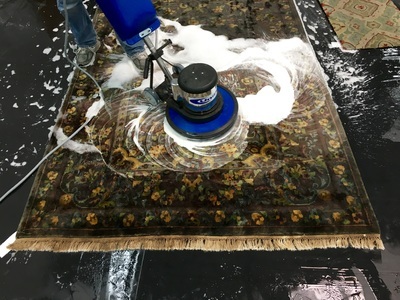 After the cleaning agent has time to act on the fibers of the rug, we use the proper equipment to clean the rug and a special formula to clean the fringes. All the soils are removed from the area rug. 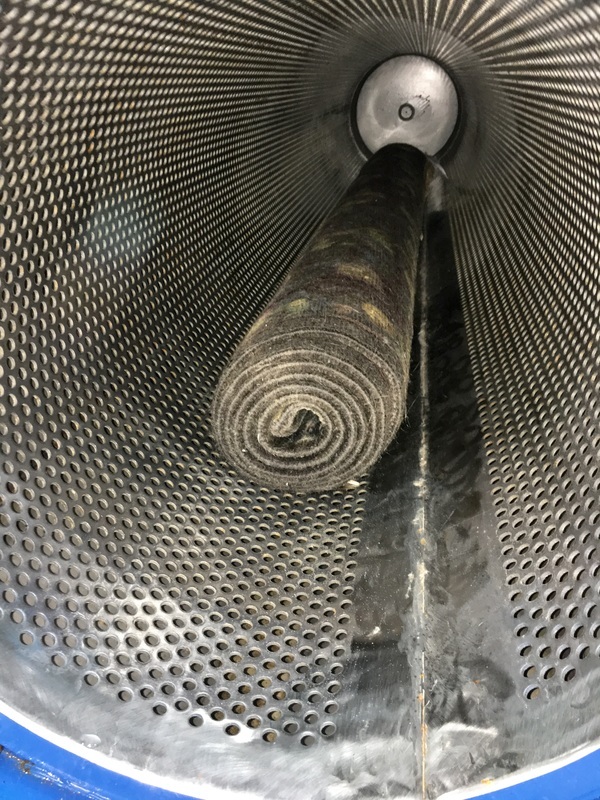 To ensure that any remaining residue is removed from the fibers, we continuously add fresh water while removing the soiled water. All soluble soils are drawn away from the rug until only clean, clear water and a thoroughly washed and rinsed area rug remain. The area rug is now clean and ready for drying. 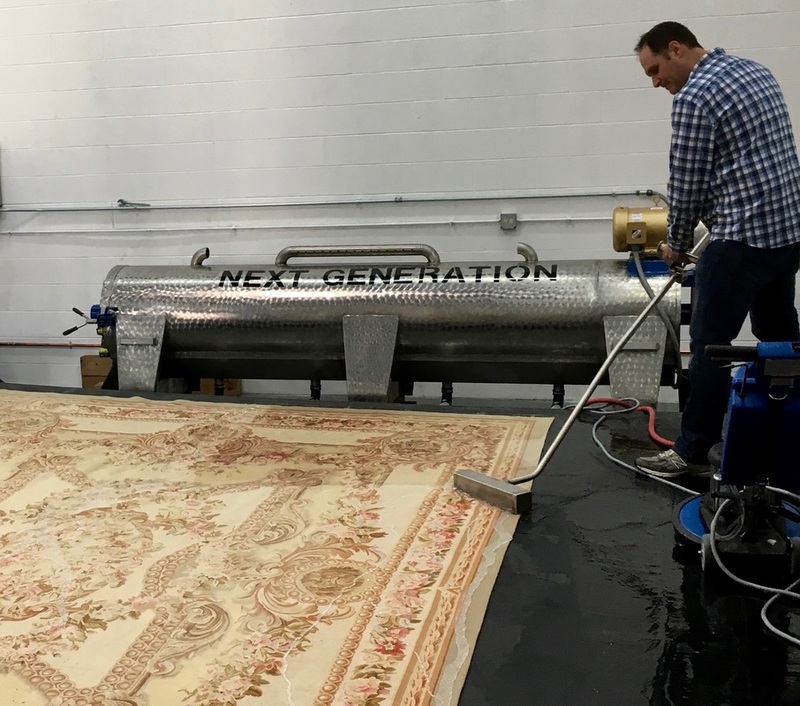 The area rug is placed in a specially designed centrifuge, which removes 98% of the water, eliminating the risk of color bleed or fading. Once removed from the centrifuge, the rug will air-dry the remaining 2%. Some delicate rugs will be flat dried using forced air. Once thoroughly dry, it will be inspected to ensure it is as clean as possible. If the cleaned area rug does not meet our standards, we will begin the process again. After meeting the standards, we will then begin the detail cleaning of any fringe using a specially designed fringe-detailing tool. Once completed, the rug is ready to be delivered to your home fresh, clean and with vibrant colors.